Chris Gardner, executive director of the Eastport Port Authority. PORTLAND, Maine — After years of delays, tax abatements and the dismantling of the former Great Northern Paper’s Millinocket facility, the proposed Thermogen wood pellet mill on that site remains in the early stages of development, but it is still live. The company also has let expire its option on 20 acres in Eastport, where it initially proposed a second pellet production facility near the deepwater port. For delays in Millinocket, Thermogen filed counterclaims against the project’s lead contractor, the New Jersey-based Conti Enterprises. Conti sued Thermogen, GNP West and project manager Cate Street Capital last year and secured a $3.85 million lien on Thermogen’s property. In its counterclaims, Thermogen alleges delays in the Millinocket project date, in part, to early 2014. At the time, the proposed $70 million project became a $140 million affair, when Thermogen decided to switch its core technology for making wood pellets to export to European markets. Thermogen alleges in court documents that Conti wasn’t able to keep up with the changes by providing quotes using the new technology. Later that year, potential investors pulled back millions. Conti claims it is owed the $3.85 million for work completed under a preliminary contract and another $12.6 million in damages because Thermogen was supposed to negotiate with it over the full contract. Thermogen claims it is owed the $2.4 million it paid Conti under the preliminary deal, because of alleged misrepresentations of the contractor’s ability. The case is still in discovery with a trial scheduled for early 2017. Meanwhile, it’s not clear whether Thermogen has another contractor working on the project. Executives for Cate Street Capital, which manages Thermogen, did not respond to an emailed request for comment Tuesday on the status of its projects. That included a proposal in Eastport. Chris Gardner, executive director of the Eastport Port Authority, said in a telephone interview that Thermogen did not renew an option on 20 acres at the deepwater port for this year. 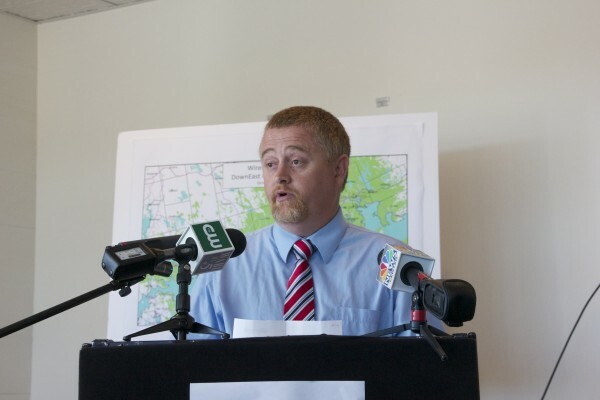 “They want to focus more intensely on their Millinocket project,” Gardner said, based on conversations with the Thermogen project leader, Dammon Frecker. The project was one way Gardner saw the port coming to the aid of the state’s logging businesses, which face a steep curtailment of the market for softwood tree species, as a result of recent paper mill closures. Another way is through the wood chip exporting business operating as Phyto-charter, which he said is waiting in the wings for global supply and demand to hit the right balance before pinning down contracts. “If we had a deal this afternoon, we could start delivering to that pad tomorrow morning,” Gardner said. As for the 20-acre parcel Thermogen previously sought, Gardner said that’s now free to market to other potential tenants. The Thermogen venture is one of a few that have remained plays for Cate Street since late 2011, according to archives of its website. It no longer lists Clean Runner, Red Desert, Purified Plastics, LifeCycle Energy or OrganicNutrition industries. Websites for many of those companies, registered to an email address for Cate Street Capital’s managing director of compliance, Robert Desrosiers, are vacant. Meanwhile, the site also registered to Desrosiers for Thermogen remains live, where the company touts a projection of having six plants in Millinocket by 2020 and a territory licensing agreement with Zilkha Biomass Technology, which would make it the only company with rights to use that company’s pellet production technology in Maine. Cate Street’s Thermogen venture continues along with two other lawsuits with connections to its Maine ventures or Maine companies. It took part of a fight over a natural gas contract at the Great Northern mill to the state’s top court late last year and is defending a lawsuit from Portland engineering firm Woodard & Curran, over a settlement in a case where a Cate Street-managed company and the engineering firm were co-defendants. Decisions in those cases are pending, and come after a longer string of lawsuits and potential litigation involving Cate Street’s Maine business or its CEO, John Halle, since the company started its projects in Maine.